Stir in the brown sugar and milk until melted, and then bring to the boil for 2-3 minutes, without stirring. Remove from the heat, and stir in the peanut butter. Add the icing sugar and stir well until there are no lumps. Transfer into a lined 20cm square baking tray, and set aside to cool to room temperature, then refrigerate until completely set. 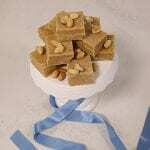 Cut fudge into squares with a sharp knife and store in an airtight container.